This page has a short article on the left-hand side, and has a book on the right-hand side. If the user click on the book, the book will be opened and the user will see Job 40 and Job 41 which are the verses about dinosaurs. Behemoth is more like Sauropod or long-necked plant eater, and Leviathan is more like dragon. The music of this page is a part of a Chirstmas song, called, “O Come”, which I play it with a recorder (small flute). The background is the heaven. Both sound and background should lead the user to feel about God. As we all know that many scientists try to disprove God by using Carbon-14 with dinosaur’s fossil, but Carbon-14 still got many mistakes; for example, living snails were C14 dated at 2300 and 27000 years old (evolutionwiki.org). These scientists need to make everyone believe that the planet earth is about 5 billion years old, because according to Holy Bible, the planet earth should not be older than 20,000 years after the Adam and Eva left the garden of Eden. 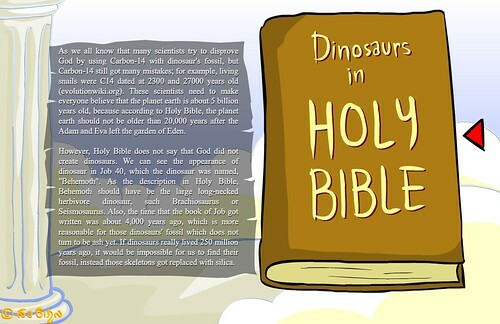 However, Holy Bible does not say that God did not create dinosaurs. We can see the appearance of dinosaur in Job 40, which the dinosaur was named, “Behemoth”. As the description in Holy Bible, Behemoth should have be the large long-necked herbivore dinosaur, such Brachiosaurus or Seismosaurus. Also, the time that the book of Job got written was about 4,000 years ago, which is more reasonable for those dinosaurs’ fossil which does not turn to be ash yet. If dinosaurs really lived 250 million years ago, it would be impossible for us to find their fossil, instead those skeletons got replaced with silica. 15 Behold now, behemoth, which I made as well as thee; He eateth grass as an ox. 16 Lo now, his strength is in his loins, And his force is in the muscles of his belly. 17 He moveth his tail like a cedar: The sinews of his thighs are knit together. 18 His bones are tubes of brass; His limbs are like bars of iron. 19 He is the chief of the ways of God: He only that made him giveth him his sword. 20 Surely the mountains bring him forth food, Where all the beasts of the field do play. 21 He lieth under the lotus-trees, In the covert of the reed, and the fen. 22 The lotus-trees cover him with their shade; The willows of the brook compass him about. 23 Behold, if a river overflow, he trembleth not; He is confident, though a Jordan swell even to his mouth. 24 Shall any take him when he is on the watch, Or pierce through his nose with a snare? 1 Canst thou draw out leviathan with a fishhook? Or press down his tongue with a cord? 2 Canst thou put a rope into his nose? Or pierce his jaw through with a hook? 3 Will he make many supplications unto thee? Or will he speak soft words unto thee? 4 Will he make a covenant with thee, That thou shouldest take him for a servant for ever? 5 Wilt thou play with him as with a bird? Or wilt thou bind him for thy maidens? 6 Will the bands of fishermen make traffic of him? Will they part him among the merchants? 7 Canst thou fill his skin with barbed irons, Or his head with fish-spears? 8 Lay thy hand upon him; Remember the battle, and do so no more. 9 Behold, the hope of him is in vain: Will not one be cast down even at the sight of him? 10 None is so fierce that he dare stir him up; Who then is he that can stand before me? 11 Who hath first given unto me, that I should repay him? Whatsoever is under the whole heaven is mine. 12 I will not keep silence concerning his limbs, Nor his mighty strength, nor his goodly frame. 13 Who can strip off his outer garment? Who shall come within his jaws? 14 Who can open the doors of his face? Round about his teeth is terror. 15 His strong scales are his pride, Shut up together as with a close seal. 16 One is so near to another, That no air can come between them. 17 They are joined one to another; They stick together, so that they cannot be sundered. 18 His sneezings flash forth light, And his eyes are like the eyelids of the morning. 19 Out of his mouth go burning torches, And sparks of fire leap forth. 20 Out of his nostrils a smoke goeth, As of a boiling pot and burning rushes. 21 His breath kindleth coals, And a flame goeth forth from his mouth. 22 In his neck abideth strength, And terror danceth before him. 23The flakes of his flesh are joined together: They are firm upon him; they cannot be moved. 24 His heart is as firm as a stone; Yea, firm as the nether millstone. 25 When he raiseth himself up, the mighty are afraid: By reason of consternation they are beside themselves. 26 If one lay at him with the sword, it cannot avail; Nor the spear, the dart, nor the pointed shaft. 27 He counteth iron as straw, and brass as rotten wood. 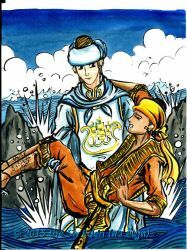 28 The arrow cannot make him flee: Sling-stones are turned with him into stubble. 29 Clubs are counted as stubble: He laugheth at the rushing of the javelin. 30 His underparts are like sharp potsherds: He spreadeth as it were a threshing-wain upon the mire. 31 He maketh the deep to boil like a pot: He maketh the sea like a pot of ointment. 32 He maketh a path to shine after him; One would think the deep to be hoary. 33 Upon earth there is not his like, That is made without fear. 34 He beholdeth everything that is high: He is king over all the sons of pride. “Read Bible Online” Accessed June 6, 2011. http://www.readbibleonline.net/. health insurance gratifaction of males. | Sw-Eden.NET. I do have 2 questions for you if you don’t mind. networking sites like your Facebook page, twitter feed, or linkedin profile? if you get a lot of spam responses? If so how do you stop it, any plugin or anything you can recommend? Hi excellent website! Does running a blog like this require a lot of work? I’ve no knowledge of coding but I was hoping to start my own blog in the near future. is off subject nevertheless I simply needed to ask. Cheers! to upgrade to a radio n router, in case you own a wireless-g router. multiple-output (MIMO) radio antennae to increase speeds. Behemoth and Leviathan Job 40-41 | Sw-Eden.NET <Loved it! it. So that’s why this piece of writing is perfect. of this sector do not notice this. You must proceed your writing. It’s an remarkable paragraph for all the web viewers; they will obtain benefit from it I am sure. I’ll bookmark your weblog and test once more right here regularly. I’m reasonably certain I’ll be informed a lot of new stuff proper right here! It’s really a great and helpful piece of information. I’m glad that you simply shared this helpful information with us. Wow, wonderful weblog layout! How lengthy have you been running a blog for? Excellent post! We will be linking to this particularly great post on our website. Now i’m very happy that I came across this during my hunt for something concerning this. Thanks a bunch for sharing this with all people you really understand what you’re speaking approximately! is great, the articles is actually nice : D.
reading this great educational paragraph here at my house. to the conclusion? Are you certain in regards to the supply? commission or on a spread. coded hachk toolss forapk files!